His Piety and Devotion to Study. A distinguished tanna of the first third of the second century. His full name was Simon b. 'Azzai, to which sometimes the title "Rabbi" is prefixed. But, in spite of his great learning, this title did not rightfully belong to him; for he remained all his life in the ranks of the "talmidim" or "talmide hakamim" (pupils or disciples of the wise). Ben 'Azzai and Ben Zoma were considered in the tannaitic school-tradition as the highest representatives of this degree in the hierarchy of learning (Tosef., Ḳid. iii. 9; Bab. Ḳid. 49b; Ber. Ḳid. 57b; Yer. Ma'as. Sh. ii. 53d; Bab. Sanh. 17b). Ben 'Azzai is especially named as an eminent example of a "pupil who is worthy of the hora'ah," of the right of independent judgment in questions of religious law (Hor. 2b). Ben 'Azzai stood in close relation to the leaders of the school of Jabneh. He handed down, "from the mouth of two-and-seventy elders," who were present on the occasion, a halakic decision, which was accepted in Jabneh on the day when Eleazar b. Azariah was elected president in the place of Gamaliel II. (Yad. iv. 2; Zeb. i. 3); also another resolution of the same day, declaring the books Kohelet and Shir ha-Shirim to be as sacred as the other Scriptures, whereby the collection of the Biblical writings, or the canon, was officially closed (Yad. iii. 5). Chief among Ben 'Azzai's teachers was Joshua b. Hananiah, whose opinions he expounded (Parah i. 1), proved to be correct (Yeb. iv. 13), or defended against Akiba (Yoma ii. 3; Ta'anit iv. 4; Tosef., Sheb. ii. 13). Akiba himself was not really Ben 'Azzai's teacher, although the latter occasionally calls him so, and once even regrets that he did not stand in closer relation as pupil to Akiba (Ned. 74b); and he expressed the same regret in regard to Ishmael b. Elisha (Ḥul. 71a). 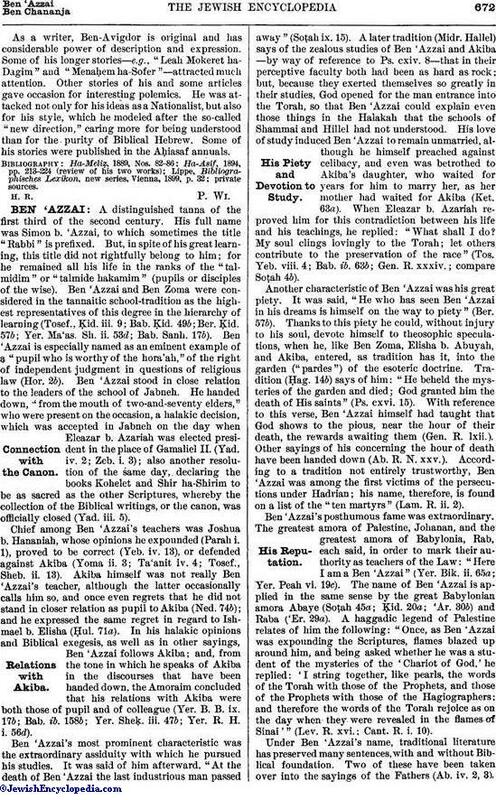 In his halakic opinions and Biblical exegesis, as well as in other sayings, Ben 'Azzai follows Akiba; and, from the tone in which he speaks of Akiba in the discourses that have been handed down, the Amoraim concluded that his relations with Akiba were both those of pupil and of colleague (Yer. B. B. ix. 17b; Bab. ib. 158b; Yer. Sheḳ. iii. 47b; Yer. R. H. i. 56d). Ben 'Azzai's most prominent characteristic was the extraordinary assiduity with which he pursued his studies. It was said of him afterward, "At the death of Ben 'Azzai the last industrious man passed away" (Soṭah ix. 15). A later tradition (Midr. Hallel) says of the zealous studies of Ben 'Azzai and Akiba—by way of reference to Ps. cxiv. 8—that in their perceptive faculty both had been as hard as rock; but, because they exerted themselves so greatly in their studies, God opened for the man entrance into the Torah, so that Ben 'Azzai could explain even those things in the Halakah that the schools of Shammai and Hillel had not understood. His love of study induced Ben 'Azzai to remain unmarried, although he himself preached against celibacy, and even was betrothed to Akiba's daughter, who waited for years for him to marry her, as her mother had waited for Akiba (Ket. 63a). When Eleazar b. Azariah reproved him for this contradiction between his life and his teachings, he replied: "What shall I do? My soul clings lovingly to the Torah; let others contribute to the preservation of the race" (Tos. Yeb. viii. 4; Bab. ib. 63b; Gen. R. xxxiv. ; compare Soṭah 4b). Another characteristic of Ben 'Azzai was his great piety. It was said, "He who has seen Ben 'Azzai in his dreams is himself on the way to piety" (Ber. 57b). Thanks to this piety he could, without injury to his soul, devote himself to theosophic speculations, when he, like Ben Zoma, Elisha b. Abuyah, and Akiba, entered, as tradition has it, into the garden ("pardes") of the esoteric doctrine. Tradition (Ḥag. 14b) says of him: "He beheld the mysteries of the garden and died; God granted him the death of His saints" (Ps. cxvi. 15). With reference to this verse, Ben 'Azzai himself had taught that God shows to the pious, near the hour of their death, the rewards awaiting them (Gen. R. lxii.). Other sayings of his concerning the hour of death have been handed down (Ab. R. N. xxv.). According to a tradition not entirely trustworthy, Ben 'Azzai was among the first victims of the persecutions under Hadrian; his name, therefore, is found on a list of the "ten martyrs" (Lam. R. ii. 2). Ben 'Azzai's posthumous fame was extraordinary. The greatest amora of Palestine, Johanan, and the greatest amora of Babylonia, Rab, each said, in order to mark their authority as teachers of the Law: "Here I am a Ben 'Azzai" (Yer. Bik. ii. 65a; Yer. Peah vi. 19c). 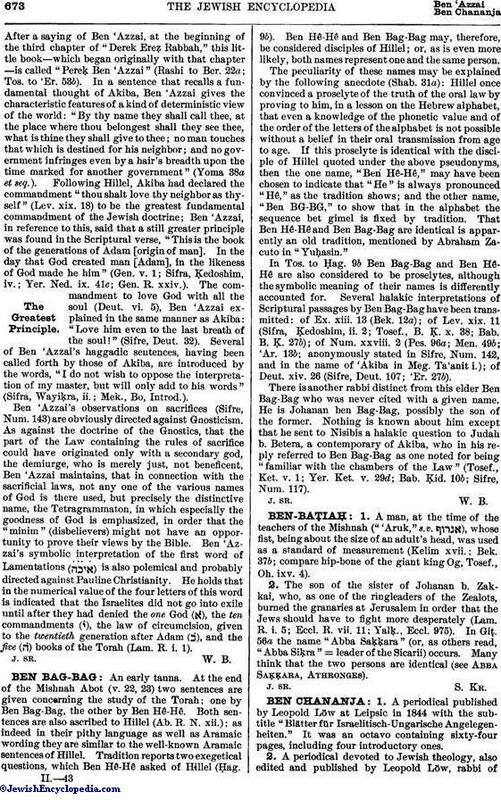 The name of Ben 'Azzai is applied in the same sense by the great Babylonian amora Abaye (Soṭah 45a; Ḳid. 20a; 'Ar. 30b) and Raba ('Er. 29a). A haggadic legend of Palestine relates of him the following: "Once, as Ben 'Azzai was expounding the Scriptures, flames blazed up around him, and being asked whether he was a student of the mysteries of the 'Chariot of God,' he replied: 'I string together, like pearls, the words of the Torah with those of the Prophets, and those of the Prophets with those of the Hagiographers; and therefore the words of the Torah rejoice as on the day when they were revealed in the flames of Sinai'" (Lev. R. xvi. ; Cant. R. i. 10). Under Ben 'Azzai's name, traditional literature has preserved many sentences, with and without Biblical foundation. Two of these have been taken over into the sayings of the Fathers (Ab. iv. 2, 3).After a saying of Ben 'Azzai, at the beginning of the third chapter of "Derek Ereẓ Rabbah," this little book—which began originally with that chapter—is called "Pereḳ Ben 'Azzai" (Rashi to Ber. 22a; Tos. to 'Er. 53b). In a sentence that recalls a fundamental thought of Akiba, Ben 'Azzai gives the characteristic features of a kind of deterministic view of the world: "By thy name they shall call thee, at the place where thou belongest shall they see thee, what is thine they shall give to thee; no man touches that which is destined for his neighbor; and no government infringes even by a hair's breadth upon the time marked for another government" (Yoma 38a et seq.). Following Hillel, Akiba had declared the commandment "thou shalt love thy neighbor as thyself" (Lev. xix. 18) to be the greatest fundamental commandment of the Jewish doctrine; Ben 'Azzai, in reference to this, said that a still greater principle was found in the Scriptural verse, "This is the book of the generations of Adam [origin of man]. In the day that God created man [Adam], in the likeness of God made he him" (Gen. v. 1; Sifra, Ḳedoshim, iv. ; Yer. Ned. ix. 41c; Gen. R. xxiv.). The commandment to love God with all the soul (Deut. vi. 5), Ben 'Azzai explained in the same manner as Akiba: "Love him even to the last breath of the soul!" (Sifre, Deut. 32). Several of Ben 'Azzai's haggadic sentences, having been called forth by those of Akiba, are introduced by the words, "I do not wish to oppose the interpretation of my master, but will only add to his words" (Sifra, Wayiḳra, ii. ; Mek., Bo, Introd.). Ben 'Azzai's observations on sacrifices (Sifre, Num. 143) are obviously directed against Gnosticism. As against the doctrine of the Gnostics, that the part of the Law containing the rules of sacrifice could have originated only with a secondary god, the demiurge, who is merely just, not beneficent, Ben 'Azzai maintains, that in connection with the sacrificial laws, not any one of the various names of God is there used, but precisely the distinctive name, the Tetragrammaton, in which especially the goodness of God is emphasized, in order that the "minim" (disbelievers) might not have an opportunity to prove their views by the Bible. Ben 'Azzai's symbolic interpretation of the first word of Lamentations ( ) is also polemical and probably directed against Pauline Christianity. He holds that in the numerical value of the four letters of this word is indicated that the Israelites did not go into exile until after they had denied the one God (א), the ten commandments ( ), the law of circumcision, given to the twentieth generation after Adam ( ), and the five ( ) books of the Torah (Lam. R. i. 1).